Refuse prescriptions for narcotic painkillers unless you feel they are absolutely necessary. Take these pills for the shortest time needed–usually 14 days or less. Then, drop unused pills at your police station in the medication collection boxes found in the lobby. If a relative taking prescription narcotics dies at home, dispose of those unused pills at the police station immediately. You may save a life by driving to the next town to find a collection box. Keep all controlled substances in a lock box at home and do not share the key or combination with anyone. Tell your doctors, including surgeons, that you want no prescription painkillers or the fewest pills necessary after an injury or surgery, then change to non-narcotic medications. Obtain Evzio, an opioid antagonist, which may save the life of someone who overdosed on painkillers or heroin. Beginning in spring 2016, pharmacists in Illinois can prescribe and dispense Evzio and any new similar antidote for opioid overdose directly to you without a doctor’s order. If you find your teen unconscious but alive, one injection of this antidote may save their life. Then, get them treatment after a brief stay in the hospital. Most teens who use heroin tried narcotic painkillers first, according to a new report. The transition from painkillers to heroin comes as no surprise to experts who study drug addiction. Prescription narcotics, also called opioids, are prescribed to relieve pain, but they can become addictive. 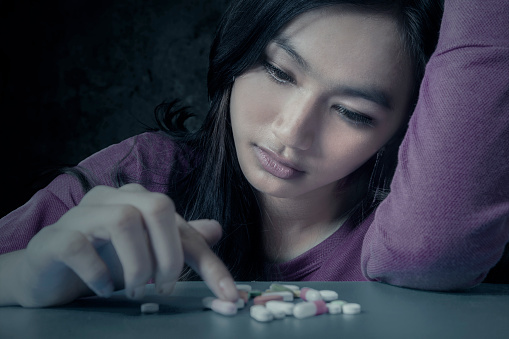 Teens who abuse them often seek a less expensive and more readily available option – heroin. Among the painkillers most often abused are Vicodin, Percocet and OxyContin. Dr. Rubinstein says OxyContin costs about $80 per pill for an 80 milligram dose. Heroin typically costs $10 or less per bag. “These folks quickly realize they can’t afford to buy the pills on the street, so cheap heroin imported from Mexico becomes their drug of choice,” he says. In the recently released report, researchers analyzed data from the 2009-2013 Monitoring the Future surveys, which questioned students in more than 100 high schools across the United States. The purpose of the survey was to assess teens’ behaviors, attitudes and values. The researchers found more than 77 percent of teens who reported using heroin also had used narcotic painkillers. In many instances, the painkillers had been prescribed to the teens’ parents, and the kids stole them from an accessible place in their own homes. Dr. Rubinstein says parents are advised to buy a simple lock box for all controlled substance medications. And further, educate your own children about the dangers of prescription pain pills starting when they are 5 years old. Talk about the topic often, and be non-judgmental. Families must discuss mental health issues and addiction concepts together and frequently so everyone knows how to recognize the signs of an early problem. “This type of discussion can be the most powerful form of prevention,” Dr. Rubinstein says.